On our "day off" we had a morning in Herculaneum (near the modern Ercolano). It is a site similar to Pompeii, but much smaller. We had a guide who took us around the ruins of this Roman town (with audio guide and ear piece to listen to her). 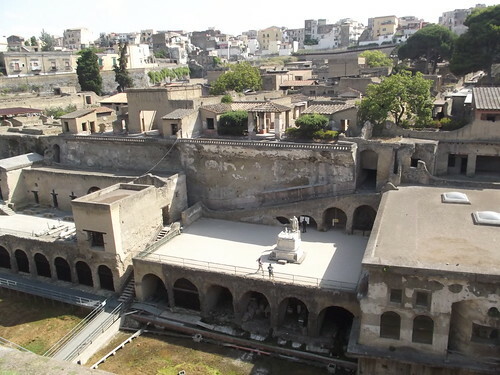 Herculaneum was founded by Hercules according to mythological tradition, but actually had Greek origins. The Greeks of Neopolis and Cumae ruled Herculaneum from the 6th century BC, while in the 5th century BC the Samnites gained control. Between the 2nd and 1st centuries BC, Herculaneum took part in the allie's war against Rome, but in 89 BC it was conquered and transformed into a municpium. In 63 AD the town was hit by an earthquake. And by 79 AD Vesuvius erupted engulfing it an a huge river of boiling mud and debris which totally covered it. Views of the ancient beach in Herculaneum.